1957 wasn't a Leap Year, and it wasn't the Year of the Frog (there is no Year of the Frog in the Chinese calendar). But you might call it the Year of the Leap Frog, since 1957 was the year that the Soviet Union responded to a streak of 20th century American technological successes, which culminated powerfully in the weaponization of nuclear forces - in 1945 with plutonium, and in 1952 with hydrogen. How did the Russians respond? 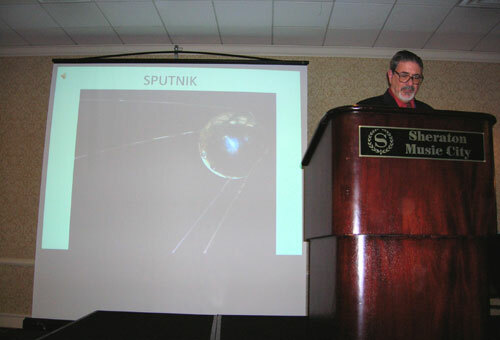 By conquering the force of gravity with the launch of Sputnik. We leapt back in front with Apollo in 1969, but since we currently rely on the Russians for a ride back home from the International Space Station in an emergency, you could argue that they're back in front again. A manned mission to Mars would be impressive, but it would be a foolish endeavor while taxpayers are busy bailing-out large sinking sectors of our economy. Photo by P. J. MacDougall. It's time for a change - a big change. Instead of racing Russia to the red planet, we should focus on Finland. Why Finland? Because while we were busy playing leap frog with the Russians - and let's admit it, it wasn't about astro-physics, it was mostly about geo-politics - the Finns became the most economically competitive country in the world in 2004, and retained that title in 2005. In 2007, the U.S. regained the title of most economically competitive, and held onto it this year, but the sub-prime crisis will likely scramble such rankings along with global economies. But, no matter what happens to our economy, or theirs, we will be playing catch-up with the Finns. That's because, according to PISA, the Programme for International Student Assessment, 15-year-old students in Finland rank at the top of the world in scientific problem-solving proficiency, and in mathematics they are tied for the lead with Chinese and Korean students. Splitting the atom and breaking the bonds of gravity were technically very challenging, and wouldn't have been possible without creative innovations in science and engineering - but throwing money at the problem helped a lot. When it comes to economic challenges, however, throwing money at the problem always makes things worse in the short term, and may make things much worse in the long term. It all depends on where you throw it. Finland seems to know where to throw it, since they achieved their envied PISA ranking with middle-of-the-pack per-pupil spending. If we assume that Finland's surge in economic competitiveness (which is largely based on their high-tech sector) is correlated with the learning power of PISA success in math and scientific problem-solving, then we can at least identify where our next "surge" needs to be. It needs to be in math classrooms and science laboratories all across the country. I am very thankful that an impressive team of American thinkers has thought about this problem. Made up from members of the National Academies of Engineering and the Sciences, and the Institute of Medicine, this team is called the Committee on Prospering in the Global Economy of the 21st Century. After collecting massive amounts of data from around the world, they issued a report entitled "Rising Above the Gathering Storm: Energizing and Employing America for a Brighter Economic Future", or RAGS for short. This report concluded with a set of twenty recommendations for Congress. Some involve how children are taught math and science, but also others call for incentives to encourage students to become not just mathematicians and scientists, but also math and science teachers. Interest in this report is not limited to Congress, nor should it be. State legislatures will play a major role in reshaping science and math education. And just like post-Sputnik, concerned citizens will provide most of the energy. I found this to be the case when I was recently invited to relay an overview of RAGS to the Nashville Women's Breakfast Club, and one of the senior editors of The Tennessean was enjoying fruit salad and scrambled eggs while I described test scores and scrambled economies. I must have done a pretty good Sputnik imitation because the following Sunday, above the fold on the front page of The Tennessean, hovering over a story about the (then) undefeated Titans, was the gleaming headline "Science gets short shrift". Midnight Sun celebrations are a great midsummer tradition in Finland, but eternal optimism is continuously celebrated in the United States.